Synopsis: Dr. Kenzo Tenma, a brilliant surgeon had just finished a successful operation when he encounters a distraught Turkish woman in the hallways. Upon seeing him, she demanded to know why he neglected to care for her son who had arrived first and instead, cared for a public official who arrived later. Conscience-stricken by hospital politics, Dr. Tenma vowed to be as fair as he possibly can. So when a boy with gunshot wounds comes in, followed by a VIP, Dr. Tenma operated on the boy, who survives, while the VIP dies. This decision would cost Dr. Tenma his promotion as he fell out of the Director’s graces, but soon after, the Director and the new Head Surgeon were found poisoned and all of the circumstantial evidence points to Dr. Tenma. 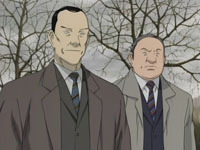 Cast out as a fugitive, Dr. Tenma struggles to hunt down the real killer while evading capture from the law. Ending is well resolved, though not on par with the rest of the series. Review: Of all the series that I’ve seen up to this point, few of them have managed to deliver an emotional impact quite like Monster. From start to finish, this series managed to capture my attention and hold it all the way through, which is a rare feat for a 74-episode series. Through its excellent narrative, rich plot (complete with twists and turns), and well-developed cast of characters, Monster represents the pinnacle of what the medium is capable of offering in a mature, compelling story. The first episode takes you into a moral quandary right away and the series begins asking a series of tough questions about fairness before probing deeper into the core of the human psyche. Part of what makes Monster so appealing is finding out an answer to the show’s basic premise of whether a monster lurks in every one of us. While the series answers that question through many different scenarios, not all of the resolutions will leave you comfortable. But because that’s what it was aiming for to begin with, Monster is able to engage its audience and deliver an unforgettable experience. Its questions on morality and ethics only serve to complement Monster’s intricate plot which boasts some of the best storytelling that I’ve seen. The story’s scope stretches beyond the mystery and suspense, and to say that the plot is competently executed is an understatement. Every story arc is brilliantly done to the point that it left me with a deep impression, and even now, I can recall even the most minor arcs with a surprising amount of clarity. That is where this series shines: there’s never a dull moment. The pacing is as perfect as it can be and every minute of it keeps you enthralled. To put it simply, Monster’s story flows excellently from beginning to end and ties it all together into a complete package without a single episode anywhere close to being wasted. Finally, the main characters are some of the deepest that I’ve ever seen. This series makes an excellent effort in the way it explores each character’s background. By taking such a step for the main characters and even the minor ones, Monster manages to make them all feel real. 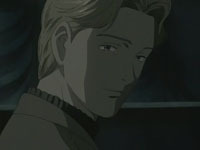 The myriad of characters, from the relentless Javert-esque Detective Runge to the selfish heiress Eva Heinemann who becomes consumed with a desire to make Dr. Tenma pay for ruining her life (her words, not mine), are really well-developed, and for the main cast, you’ll see them change as the series goes on. 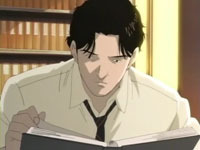 Naturally, no review of Monster is complete without a mention of how Johann Liebert may very well be one of the best anime villains to ever exist. The length to which he goes to torment those around him is absolutely sadistic and few characters can match his calm demeanor that leaves the viewer unnerved because of his mastery over the basic concept of fear and how to inspire it in others, including the viewer. 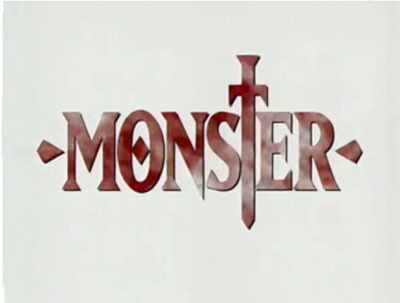 There’s just so much to take in when watching Monster and one just cannot help but be impressed with the depths to which they went in exploring the characters and structuring the plot. Though it is audacious to make the statement that Monster may very well be the best show of the decade, it’s equally apparent that few shows can top it. With all that it puts forth, there’s really only one description that is fitting of such a series: a true masterpiece. Hmm will have to check this out. 74 episodes though.. yikes! you should try the series TORADORA!!! great soundtrack!!! bakemonogatari has a great soundtrack too!!! and K-ON is always good. Hopefully it pans out. The show might not be everyone’s cup of tea, but I really enjoyed the plot and the characters a great deal! I have only watched 4 episodes of Monster when I was in high school but I couldn’t find time to continue watching it because of studies and work.